The trifurcation of the Himachal Pradesh State Electricity Board into the generation, transmission and distribution power utilities is yet to be implemented. Responding to the queries from The Tribune after delivering a good dose self-examination for the engineers during the HPSEB’s Engineers Association’s fifth biennial conference here last night, Chief Minister Virbhadra Singh said the state government did not want to rush into trifurcating the board into generation, transmission and distribution entities. The Himachal Government has decided to close down 155 schools under the rationalisation exercise. According to sources, 128 primary and 27 middle schools which did not fulfil either the distance or minimum strength norm will be closed. While the staff deployed in these schools will be posted to other institutions, the students will be shifted to the nearest school. Blaming the “visionless policies” of the Virbhadra regime for its failure in tapping the vast hydro-electric potential in the state, a former BJP minister, Mr J.P. Nadda, today said that ridiculing the engineers of the electricity board was not a solution to the problem. Though the state government had terminated the Memorandum of Understanding signed with a Delhi-based company on September 20, 2004, but the same company has now been awarded the 17 MW Sai-Kothi power project in Chamba district allegedly under the influence of some senior officials. 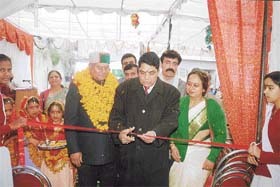 The Lakshman Club of Chamba, which has been housed in a three-room building for the past 35 years, has been asked by the Public Works Department to pay rent of the building occupied by the club till date, whereas the management is of the view that the club was shifted from the DC’s office to the present building by Mr S.K. Chauhan, the then Deputy Commissioner of Chamba, in 1970. The Himachal Pradesh chapter of the Vivekananda Vichar Manch today launched a week-long state-wide campaign to create awareness among the people about the imbalance being created because of an exorbitantly high growth rate of religious minorities like Muslims and Christians. Criticising the UPA government in the Centre for failing to check the rising prices of sugar, the former Union Food and Civil Supplies Minister, Mr Shanta Kumar, alleged that Congress leaders were hand in glove with sugar mill owners for allowing them to hike the prices. The Chief Minister, Mr Virbhadra Singh, today appealed to the villagers not to abandon cows and other animals as they were posing problems not only to farmers but were also a traffic hazard. The District Ex-Servicemen Committee has observed that thousands of competent, educated unemployed youths of the district got disillusioned when they were debarred from taking part in the Army recruitment rally held here from February 11 to 14 on the ground of physical standards. The Himachal Pradesh Board of School Examination today postponed the practical examinations of the plus two class for the regular students of all schools of Lahaul and Sipiti district, following heavy snowfall in the district. Local Government Senior Secondary School celebrated its annual day today. Col Dhani Ram Shandil (retd), MP, was chief guest on the occasion. Two rooms constructed with MP funds were also inaugurated. Ms Poonam Sood, school Principal, read out the annual report. Monu (10), a boy, fell into a well at Main Bazaar here yesterday while catching a kite. He slipped from the roof and drowned in a nearby well. Local youths fished him out with immense efforts. The trifurcation of the Himachal Pradesh State Electricity Board (HPSEB) into the generation, transmission and distribution power utilities is yet to be implemented. Responding to the queries from The Tribune after delivering a good dose self-examination for the engineers during the HPSEB’s Engineers Association’s fifth biennial conference here last night, Chief Minister Virbhadra Singh said the state government did not want to rush into trifurcating the board into generation, transmission and distribution entities. “We are analysing the experience of trifurcation of the board in other states as well”, he said. Cutting the HPSEB down to its size Mr Virbhadra Singh appreciated the work done by the board’s engineers in the 1500 MW NJPC, Sanjay Vidyut project and cent per cent electrification in the state, but he said the board had been able to tap just 335 MW of power in the state so far. “It would add another 322.5 MW once its seven small and micro hydel projects are completed”, he said. Mr Virbhadra Singh said the board will be awarded smaller projects and not the big ones and can bargain for big ones according to its performance. “The board can carry out these smaller projects to show its performance in order to get bigger ones”, he asserted. Even the Power Minister, Ms Vidya Stokes, who presided over the conference, sounded reform-savy, but she avoided a direct reference to the trifurcation of the board considering that board’s 35,000 strong work force had emerged as a big pressure group in the state politics. “The power reforms are needed to revive the board. The projects are delayed by two-three years and that shoots up the cost of construction. “The energy audit is being done. Consumer care services are being upgraded through the Accelerated Power Reforms project in the state”, she said, pointing out her unhappiness over the 126 MW Larji project being executed by the board as its cost has shot up drastically. Even the board is divided between the pro-power reforms engineers and those who are against the trifurcation. The pro-reforms engineers revealed that the setting up of the Pabbar Valley Hydro Power Corporation and the Jal Vidyut Nigam as board’s two sister corporations were the steps taken in the direction of trifurcation of the board. They said the sister corporations would bring in funds, professionalise the board to generate more power and make the board accountable for its performance like NTPC, NJPC NHPC, which have emerged as the country’s three top “generation corporations”. “Over 50 per cent of HPSEB’s engineers are working in the 1,500 MW project in Bhutan. The NJPC, NTPC and NHPC engaged in power generation in Himachal are tapping board’s engineers then why is the state government shying from awarding bigger projects to the board”, they said. “The board is providing subsidised power at the rate Re 0.85 per unit to domestic consumers, the lowest rate in the country. Still the board is rated as the sixth best board in the country. Trifurcation will add to financial burden. Certainly three separate corporations will ring in specialisation in the long run, but the state government has to see welfare of domestic consumers in the state where they can afford higher rates”, said Mr D.N. Bansal, Member (Operation), HPSEB. Pleading the case of the HPSEB’s engineers, Mr A.K. Sood, organising secretary, HPSEB’s fifth biennial conference, said the trifurcation of board in states like Haryana and Orissa has shown bad results. “The boards have not been be able to improve their performance. The board should get bigger projects as most of the top engineers are being tapped by the outside agencies,” he said. SHIMLA: The Chief Minister said that his government was considering making field service compulsory for all departmental officers before making them eligible for the next promotion and other benefits. He exhorted the public servants to dedicate themselves towards efficient delivery of services to the people and adhere to the time schedules for completion of developmental work. He said that the officers who had to man the departments needed to be acquainted themselves with the difficulties in working in remote and backward areas. The Chief Minister said that officers should make it mandatory to take field inspections so as to monitor the progress of the projects regularly to ensure quality control and adherance to the time schedule. The Himachal Government has decided to close down 155 schools under the rationalisation exercise. According to sources, 128 primary and 27 middle schools which did not fulfil either the distance or minimum strength norm will be closed. While the staff deployed in these schools will be posted to other institutions, the students will be shifted to the nearest school. Officially the schools are being merged and the necessary notifications will be issued soon. Primary schools with the strength of less than 10 students and where another school is functional within a radius of 1.5 km in hills and 2.5 km in plains have been closed. Maximum number of 44 schools have been closed in Shimla district, followed by Kangra (28) and Mandi (26). The rationalisation exercise will to some extent enable the government to provide adequate staff in schools affected by the shortage. An anomalous situation has been prevailing with schools with low enrollment having more teachers and those overflowing with students plagued with shortage of teachers. For instance in Lahaul-Spiti there were eight schools which had no students. Reacting to Mr Virbhadra Singh’s statement that 38,000 employees of the HP State Electricity Board (HPSEB) had been able to generate only 329 MW of power, he said this would only demoralise the employees. “The Chief Minister should know that the majority of the HPSEB employees are engaged in transmission and distribution and not in generation,” he remarked. Moreover, the transmission and distribution system in Himachal Pradesh was amongst the best in the country, he added. In a statement issued here today, Mr Nadda said the manner in which Mr Virbhadra Singh had blamed the engineers of the HPSEB for poor generation at Sundernagar yesterday, would only leave them demoralised. “It will be far better if the Chief Minister, instead of blaming the employees for poor performance, will take concrete policy decisions for power generation,” he said. Mr Nadda further said that the interference from the government had virtually converted an autonomous body like the HPSEB into a government body. “The HPSEB, which has long been awaiting major reforms, nationalisation and responsible delegation is at present being guided by visionless policies of the government,” he said. Though the state government had terminated the Memorandum of Understanding (MoU) signed with a Delhi-based company on September 20, 2004, but the same company has now been awarded the 17 MW Sai-Kothi power project in Chamba district allegedly under the influence of some senior officials. The state government has constituted a high-level committee and a Cabinet subcommittee to sign MoUs with private companies. These committees would give nod to the Sai-Kothi project on February 16, sources revealed. The Himachal Pradesh Department of Multipurpose Projects, on September 20, 2004, terminated the MoU signed with M/s Venture Energy and Technologies Ltd, Delhi, for the Sia-Kothi project on June 14, 2002, during the BJP regime. The government’s termination order, copy of which is in possession of The Tribune, showed that the company misrepresented the facts in papers submitted to the Power Ministry, Government of India. “It inducted an NRI as foreign direct investment (FDI) in the project”, the order said. The government found that the company also tempered with the equity position of the Clause 16 of the MoU, and issued a show cause notice to the company on December 12, 2002, during the HVC-BJP government’s regime. The sources revealed that whereas the government could have registered a case against the company under Section 420 of the IPC the subcommittee was again signing the MoU with the same company under influence of some top officials. The company in its reply submitted to the government on December 26, 2002, failed to satisfy the government as it turned out to be contrary to the facts. Thus the government terminated the MoU signed between the state government and the company in public interest. Consequently, the company bank guarantee of Rs 10 lakh was also forfeited in favour of the state government as it violated the Clause 16 and 24 of the MoU. Though the company had acquired land for the site it was not restored to the state government along with bank guarantee after the government terminated the MoU. When the Power Minister, Ms Vidya Stokes, who is also a member of the Cabinet subcommittee, was contacted she said the subcommittee would look into the reply filed by the company. “The Cabinet will re-examine the MoU signed with the company and the final decision would be taken after that”, she added. The Lakshman Club of Chamba, which has been housed in a three-room building for the past 35 years, has been asked by the Public Works Department to pay rent of the building occupied by the club till date, whereas the management is of the view that the club was shifted from the DC’s office to the present building by Mr S.K. Chauhan, the then Deputy Commissioner of Chamba, in 1970. Therefore, the question of paying any rent does not arise as the rest of the portion of the building is with the government offices. Presently about 100 members are enrolled with the club. With the limited sources of the club, the management had constructed a tennis room and a billiard room. The present badminton hall was constructed on the premises of the club during the tenure of the Deputy Commissioner, Mr Tarun Kapoor, in 1996. The club is at the moment in desperate pecuniary difficulties. The club management has also requested the DC to hand over the badminton hall to the club, but it is strange that the badminton hall, which was constructed by the government, has been handed over to the District Badminton Association and it is a sheer violation of the rules. Not only this, the Electricity Department has removed the electric metre of the club from the badminton hall without the knowledge of the club. The Lakshman Club is perhaps the oldest club in Himachal Pradesh. Before partition, the late Mr Jawant Ram, former Speaker, Himachal Vidhan Sabha, was its first secretary. The Raja of the state used to be the president. Even after partition, the existing building of the Deputy Commissioner’s office was with the club. The present Municipal Committee office was the squash court and the parking lot of the court complex was tennis court with the club. But with the passage of time, only three rooms were left with the club in the DC’s office. For many years, the club remained in the three rooms. It was during the tenure of Mr S.K. Chauhan, the then DC of Chamba, that he shifted the Lakshman Club from the DC’s office building to the present Revenue Kothi in 1970. At that time, Mr Chauhan had also written to the Chief Secretary of Himachal Pradesh that the whole DC’s office building along with municipal office and tennis court were with the Lakshman Club. Mr Chauhan had mentioned that he was advised by the SP, Chamba, not to keep the club and the DC’s office in the same building due to security reasons. He had written that he was shifting the club to Revenue Kothi and giving it the same accommodation which the club was having in the DC’s office and for the rest of the portion in Revenue Kothi, a token rent of Re 1 be charged as had been done in the case of the Durga Club, Solah. The manch will organise seminars, media conferences and public meetings at the state, district and village levels during the campaign, which will end on February 20. Explaining the objective of the campaign at a press conference here today, Mr B. Sharma, convener of the manch, and Dr Veer Singh said that if corrective steps were not taken, Hindus would be reduced to a minority by 2050 which in turn would pose a serious danger to the rich cultural heritage of the country. According to the figures released by the Census Department on September 6, 2004, the growth rate of Hindus was only 20.3 per cent whereas that of Muslims was 36 per cent. The latest census data caused a furore in the country, following which the government revised the figures within four days in which population of Muslim-dominated states like Jammu and Kashmir and Assam was excluded. This brought down the growth rate of Muslims to 29.3 per cent. They said countries like Afghanistan, Pakistan and Bangladesh came into being only because of population imbalance and if the prevailing trend was allowed to continue, the integrity of the country would be jeopardised. The ultimate aim was to start a serious debate on related issues like the common civil code, the family welfare programme and large-scale illegal migration from Bangladesh. Criticising the UPA government in the Centre for failing to check the rising prices of sugar, the former Union Food and Civil Supplies Minister, Mr Shanta Kumar, alleged that Congress leaders were hand in glove with sugar mill owners for allowing them to hike the prices. Addressing a meeting of BJP members from Nurpur, Jawali, Gangath and Guler Assembly constituencies here this afternoon, he said the hike was not justified as the country was producing 250 lakh tonnes of sugar annually against the annual consumption of 1,85 tonnes. He categorically denied any rift in the state BJP leadership and added that the party was playing a vital role of Opposition in the state. Addressing party workers, Mr Chander Sen Thakur, general secretary of the state unit of the BJP condemned the Chief Minister, Mr Virbhadra Singh, attaching Mr Shanta Kumar, and a former Chief Minister, Mr Prem Kumar Dhumal, during his winter sojourn in Kangra district. He said BJP would give a befitting reply to the Chief Minister within next few days. Later members of the yuva BJP morcha units of Nurpur and Jawali subdivisions under Mr Chander Sen Thakur held demonstration and submitted a memorandum to the Governor through the SDM, Nurpur. They protested against the signing of an MoU, failure of the state government to provide employment, deteriorating law and order and laying of foundation stones by Mr Virbhadra Singh during his winter sojourn in Kangra district without any budgetary provision. He was addressing a gathering here after inaugurating a gau sadan (cow shelter). The shelter was constructed at the cost of Rs 5 lakh by a social organisation, Kalyan Gau Sadan. He also laid a foundation stone of a commercial complex to be constructed near the bus stand at the cost of Rs 2.31 crore. He said the government had decided to open cow shelters at various places in the state. The government had decided to conduct a census of domestic animals. He said the commercial complex would be constructed by the Sundernagar Municipal Council. This complex will have 74 shops, two restaurants, one parking lot and two community halls. The complex will help the council to raise funds. Mr Kaul Singh Thakur, Irrigation and Public Health Minister, and Mr Tek Chand Dogra, MLA, Nachan, also addressed the gathering. The District Ex-Servicemen Committee has observed that thousands of competent, educated unemployed youths of the district got disillusioned when they were debarred from taking part in the Army recruitment rally held here from February 11 to 14 on the ground of physical standards. It demanded to segregate the physical standards of recruitment for the youth of Chamba region. Expressing concern over the nationwide uniform physical standards laid down for Army recruitment, Lt-Col Ravi Vaid, president of the District Ex-Servicemen Committee, said here today that the average height of the youths of Chamba was much less than the Dogra belts of Himachal Pradesh and Jammu and Kashmir for which the geographical locations on the hill were responsible and was beyond the control of the natives. He said the issue had already been taken up with the state and the Central governments through the proceedings of the Zila Sainik Board meetings for segregating the height of youth of Chamba with the Dogra belts for the purpose of recruitment to the armed forces. The Himachal Pradesh Board of School Examination today postponed the practical examinations of the plus two class for the regular students of all schools of Lahaul and Sipiti district, following heavy snowfall in the district. The examinations were scheduled to be held on February 17. Ms Anju Pathak, spokesperson for the board, today said that the Secretary of the board had notified that the practical examinations of physics, chemistry, biology, geography, information technology and physical education subjects of plus two class had been postponed. She said the board took the decision in view of the heavy snowfall in the district. She said the practical examinations would be conducted after the theory examinations. The fresh datesheet of the practical examinations would be circulated in due course. Congress MLA Raghu Raj, President of local Municipal Council Meenakshi Sharma, pradhan of the Taksal panchayat Saraswati Devi were also present. Col Shandil and Mr Raghu Raj announced financial assistance of Rs 6 lakh and Rs 4 lakh respectively, for school building. Students presented a colourful culture programme. Monu (10), a boy, fell into a well at Main Bazaar here yesterday while catching a kite. He slipped from the roof and drowned in a nearby well. Local youths fished him out with immense efforts. The boy was rushed to the Civil Hospital in serious condition where he died.